Our ‘Then’ photo was probably taken in 1931, the year JCPenney was built next to the Market. JEAN SHERRARD STOOD at what is known as the front door to Pike Place Market, the intersection of First Avenue and Pike Street, and hoisted a pole that extended as tall as the base of the Market’s clock. He pointed his heavy Nikon eastward, up the center of Pike Street. From a similar perch about 87 years earlier, a Webster and Stevens Studio photographer also looked east on Pike to record this week’s “Then” photo. 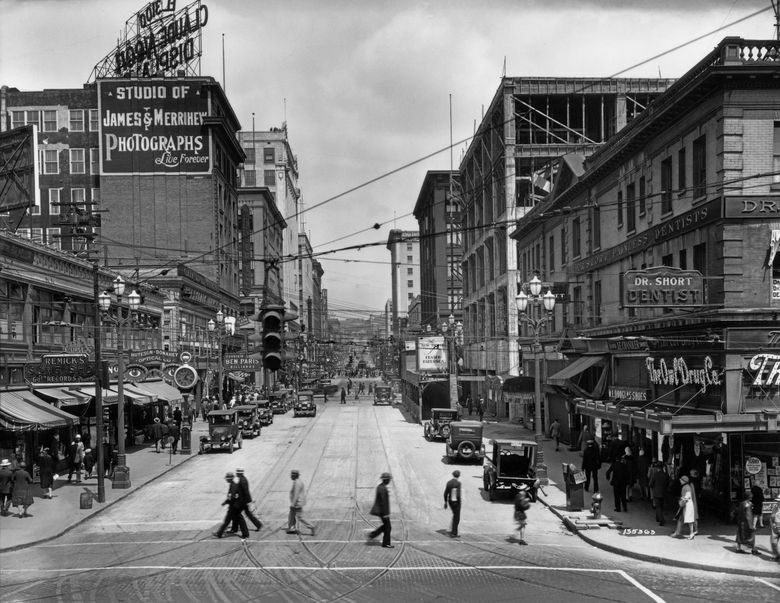 We are dating this photo as circa 1931, based not on the automotive license plates, which are hard to read, but rather the five-story construction underway for the department store at the southwest corner of Second Avenue and Pike Street, here right-of-center and still without windows. Ten years later, Seattle traded financial troubles for the anxieties and orders of World War II. By then, the Hahn family had been associated with the intersection of First and Pike for more than 60 years. 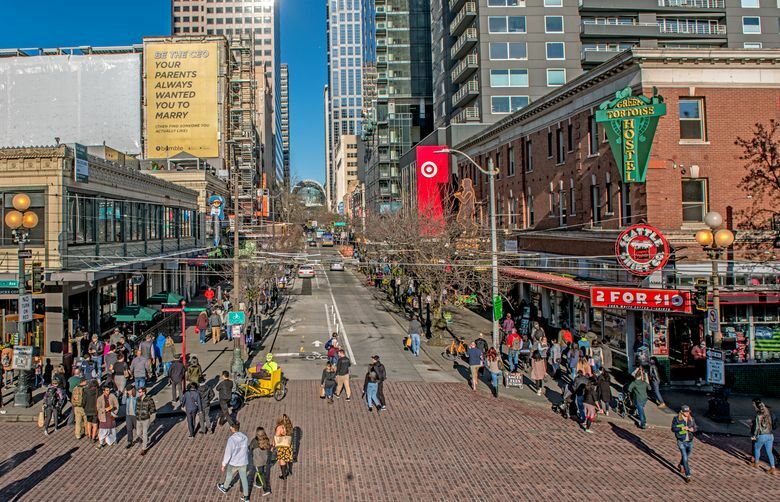 Robert Ernest Hahn, a German immigrant from Saxony, arrived in Seattle in the late 1860s and soon purchased the southeast corner when First (then named Front Street) and Pike were mere paths. Their neighbors included Seattle pioneers Arthur and Mary Denny and the lesser-known C.B. Shattuck. Shattuck managed the Seattle Coal and Transportation Company, which from 1871 to 1878 moved coal from the company’s mine at Newcastle to its coal wharf and bunkers at the foot of Pike Street. The route required both barges on the lakes and trains running between them, and the last section of rails crossed this intersection. Choosing not to get soiled by working for his neighbor, Hahn instead thrived as a painter and interior decorator, continuing to buy property and, with his wife, Amelia, raise a family of five children. By the time of Seattle’s Great Fire of 1889, the Hahn corner was a popular summer retreat from the heat, with a beer garden; real estate maps indicate it was approached from Pike Street. In 1909, the Hahns completed what survives as First and Pike’s southeast corner post, the three-story brick Hahn Building, also long known as the Elliott Hotel and seen in our “Now” photo as the Green Tortoise Hostel. The recent proposal that it be razed for a high-rise is rousing the Market’s many friends to protect this “humble 100-year-old guardian structure” from the wages of plastic and glass.